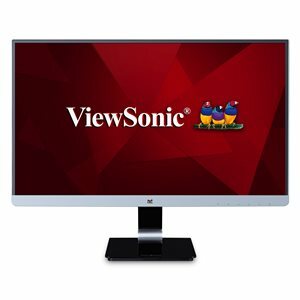 Style and substance go hand-in-hand with the ViewSonic VX2478-SMHD monitor. With SuperClear IPS panel technology, wide viewing angles, and amazing screen performance this monitor delivers visual clarity perfect for office use, graphic design, and home entertainment. Sleek edge-to-edge frameless screen makes a standout statement in any home or office. 2560 x 1440 resolution and dual speakers, deliver an immersive viewing experience for multimedia applications. Versatile HDMI, DisplayPort, and Mini DisplayPort inputs keep you connected to your favorite devices. Adjustable forward/back tilt, and anti-glare hard coating panel surface. dimensions 5.1" x 16.3" x 1.6"
At four times the resolution of a traditional 720p panel, and almost double that of a traditional 1080p display, WQHD results in a much sharper image, with no distortion or stretching, all while maintaining the same 16:9 aspect ratio. WQHD resolution also provides up to 77% more screen space for a more immersive experience. Style and substance go hand-in-hand with the ViewSonic VX2478-smhd 24" (23.8” viewable) WQHD monitor. SuperClear IPS panel technology, wide viewing angles, and best-in-class screen performance deliver outstanding visual clarity perfect for office use, graphic design, and home entertainment. A premium ID includes a sleek edge-to-edge frameless screen, that when combined with vivid 2560x1440 resolution and dual speakers, deliver an immersive viewing experience for multimedia applications. Versatile HDMI, DisplayPort, and Mini DisplayPort inputs keep you connected to your favorite devices, while the modern, flush-mount frameless bezel design makes a standout statement in any home or office. HDMI, DisplayPort, and Mini DisplayPort inputs give you the freedom to connect your monitor to a variety of devices. DIMENSIONS (W x H x D):21.3 x 16.6 x 7.5 in.